The fifth installment of the series that started the toys-and-games craze goes on sale tomorrow, which means stores packed with baffled parents trying to make sense of it all. We’re here to help. Now that your children have finished collecting all the toys from Skylanders: Spryo’s Adventure, Skylanders Giants, Skylanders Swap Force and Skylanders Trap Team, Activision is back with another truckload of toys for young and young-ish fans to purchase and play with. This time around the truckload is nearly literal—Superchargers’ deal is that now the Skylanders are paired with land, sea and air vehicles, which can be customized, raced or otherwise used to battle enemies and overcome obstacles in the core game. It bears noting that this installment includes online multiplayer in the form of adventure mode cooperative play and competitive racing. As with any game that can involve online communication, perch on your childrens’ shoulders like protective hawks and make sure nothing happens to your little darlings. Don’t interrupt their game, but feeding them a regurgitated worm now and then is acceptable. Let’s get right to it then. The good news: Activision has seriously lowered the amount of new characters being released with Superchargers as compared to previous games in the series—only 20 brand new or retooled characters are on the way. That doesn’t seem too daunting, does it? That’s nothing. But then each character will also have a corresponding vehicle to collect, so that’s 40 toys in all. And while any character (including every older Skylander) can ride in vehicles, matching the new character to their specific vehicles “superchargers” it, so you’ll want to make sure you have the right toy for the right...toy. Then there’s the fact that the Nintendo console releases come with different starter toys, including new Donkey Kong and Bowzer figures that double as Amiibo—if you’re a parent who doesn’t know what an Amiibo is yet, count your blessings. Now it’s a bit confusing, but we’ll work through it. This is the basics right here. You’ve got Spitfire and Hot Streak, a Skylander and vehicle combo made for each other, and Super Shot Stealth Elf, an older character with a brand-new mold and completely different skills than its older counterparts. The only vehicle needed to complete the game is a single land-based vehicle, so the starter fits the bill. Air and sea portions of the main game can be skipped, though completing them can significantly alter the look, layout and difficulty of game levels. Maybe don’t tell your kids that. It’s the same package, only Spitfire and ride are replaced with Turbo Charge Donkey Kong and the Barrel Blaster. As mentioned previously, that Donkey Kong doubles as an Amiibo figure for Nintendo games that support the character. Note that Donkey Kong will not work with non-Nintendo versions of the game. The Nintendo 3DS has traditionally gotten a different version of each new Skylanders game, normally a standalone adventure with loose ties to the full release. Now the Wii joins its handheld cousin in a game that’s more racing, less adventure. I’ve seen nothing of either of these games, so I could not tell you anything about them. That’s generally not a good sign. Update: Reader Erich52 gave us a first-hand account of the 3DS version in the comments. Pasting it here, with a little light editing. I work at Toys’R’Us. Activision sent us the 3DS version to show off to the kids last Saturday. It was a complete version of the game! Being a Skylanders completionist, I was stoked. I was able to...ahem...the kids were able to...ahem...complete about ten races. It was ALL racing. But there was a lot of it. Very well done, fluid, action based racing. Like Mario Kart with more shooting. There was even an adventure mode that lead you through the courses. Or a traditional “cup mode”. You needed a different vehicle to play the three different styles, but the the race master would loan you a dumpy car if you hadn’t bought a real one yet. Characters were a one time load like the last two entry’s on 3DS. And winning races leveled up your Heroes and vehicles. It really was a solid entry. Wii owners and 3DS owners, it’s ok. The racing game is good. Note however, that both of these versions come with an exclusive Bowser Amiibo/Skylander, and neither it nor his vehicle are currently available outside of those sets. Again Bowser will not work with non-Nintendo versions of the game. If you or your kids want to play Skylanders Superchargers on the iPad, new Apple TV or iPhone, that starter pack arrives October 25. 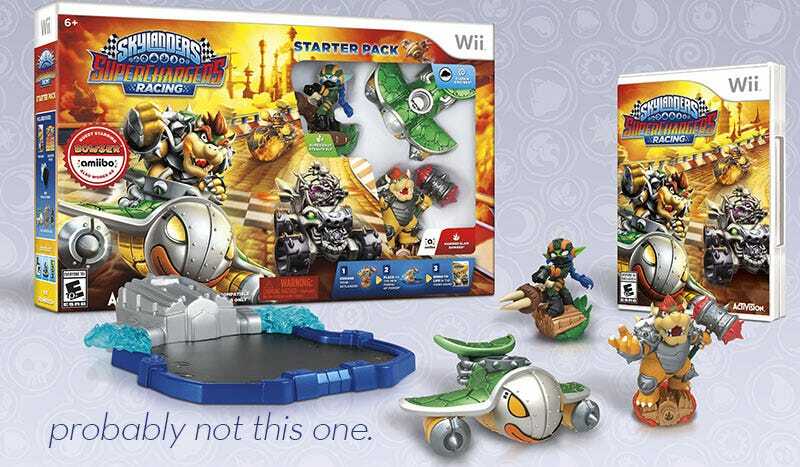 One final means of acuiring the game that bears noting is that systems with digital download capability will be offering a Skylanders Superchargers Portal Owners Pack, which comes with the game itself and the ability to play with digital versions of Spitfire and his land-based vehicle. As of this writing I am not seeing a price for the Portal Owners Pack online, so check your console’s digital store tomorrow. It’s the regular starter kit, only the figures have dark paint jobs, there’s an extra vehicle and a Kaos Trophy that lets players race as the evil overlord of the game during online multiplayer. Keep in mind that Dark Edition characters and figures are considered separate from regular ones as far as the game is concerned, so Dark Spitfire only supercharges the dark version of his car. That also means neither the Stealth Elf or the submarine in the package have legitimate figure/vehicle partners currently. That’s a lot of unique dark characters, isn’t it? Have I got some good news for you. Unlike previous entries in the Skylanders series, the story mode of Skylanders Superchargers does not contain Elemental Gates. This means there is no main story content that specifically requires a character from one of the game’s ten elements—Undead, Life, Fire, Water, Air, Tech, Magic, Earth, Light and Dark. The only barriers present in the main story are areas that require a land, sea or air vehicle. Since every starter pack (barring Wii and 3DS which do not count) includes a land vehicle, that just leaves a water vehicle and an air vehicle. Activision says $14.99, GameStop says $15.99 and Toys’R’Us says $16.99, so shop I’d definitely shop around. Sky Slicer seems to be the only singular air vehicle available at launch, so definitely grab that. As for water, I prefer the sleek Sea Shadow—which is included with the Dark Edition starter packs. If you absolutely, positively must have everything available at launch for your system of choice, good luck. I’d suggest picking a starter pack and sticking with it. If you’re on the Wii U you might have to grab a 3DS starter for the Bowser and his vehicle on top of the regular starter. If you’re a fervent Amiibo collector, god be with you. We’ll just stick with the PlayStation version as an example. You’ll need a starter pack, of course. There are four individual figures launching in the first wave—Fiesta, Stormblade, Shark Shooter Terrain and Dive-Clops. There are also four vehicles being released on launch day—Sky Slicer, Sea Shadow, Dive Bomber and Crypt Crusher. Then there’s also the Sea Racing Action Pack for $34.99, the first of three packs that contain new characters and vehicles and unlock new race tracks and villains to race as. The Sea Racing pack includes Deep Dive Gill Grunt, his Reef Ripper vehicle and the Golden Queen Sea Villain. So that’s $75 plus $52 plus $60 plus $35 — $222, if my math is correct, and I make no promises. Not too bad this time around! Find the right sale and you might make it through wave one under $200. Of course parents who’ve been through this a couple of times know the next group of figures is generally hot on the heels of the first, so I wouldn’t dump the change into the college fund just yet. So make your list, check it twice. Then check it a third time. If all else fails, ask the nearest 12-year-old for help.